A Herniated Disc is one of the most common causes of back discomfort in adults, yet it remains one of the least understood sources of chronic pain. Each year, thousands of people suffering from back pain caused by ruptured, or Herniated, discs resort to serious invasive medical procedures, such as surgery or injections, in an effort to alleviate their pain, and return to normal living. But are such types of Herniated Disc treatment really the only answer? 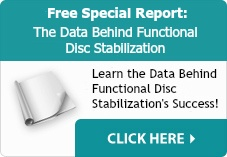 A disc is essentially a little shock absorber that allows for motion of the spine. Each disc is like a little rubber cushion which works to lessen the impact on the bones that make up the spinal column from such normal things like walking and jumping. These discs are filled with a jelly like substance - known as the nucleus - that provides the cushioning element. When the element that holds this jelly-like substance in place deteriorates, a rupture can result which allows some of this substance to ooze out, thus reducing the cushioning effect, and leading to pain. Most people think that this process can only result from an injury, or other trauma to the back, such as heavy lifting, or a fall. Yet the truth is that this is not always the case. Many Herniated Disc injuries are simply the result of the aging process. The jelly like cushioning substance in each disc is primarily composed of water, and as you age discs lose some of their water content. As water is lost, the discs become less flexible, leaving them susceptible to tearing through normal activity. This results in pain, and the search for a Herniated Disc treatment to relieve this pain. One of the most promising Herniated Disc treatment options to emerge from years of experience in treating back pain is centered on the core issue in many disc related injuries; namely, disc dehydration. Dr. Jeff Winternheimer of the Illinois Back Institute has developed a revolutionary new technique which focuses on rehydration of the spinal discs as a means of relieving this condition. By developing a Herniated Disc treatment that targets the core problem leading to disc degeneration, the Illinois Back Institute gives patients a viable option to the normal invasive procedures of surgery and painful injections. Functional disc rehydration treats the condition from the inside out, and works with the body's own healing properties by resupplying the damaged disc with the substance which can lead to the susceptibility to injury when missing. Once the proper hydration level has been restored to a damaged spinal disc, the normal supply of oxygen and essential nutrients can begin to flow again, allowing the disc to regain its normal characteristics, and begin to function again as usual. Then the surrounding muscles are able to be reactivated and reintegrated to work with a healthy disc, and bring relief to the patient. The good news for those suffering from this condition is that there is an effective alternative to Herniated Disc treatment options which does NOT require drugs, injections, and surgery. Functional Disc Rehydration is a means of going after the heart of the problem, and letting the body help to heal itself. And it works.